What a GIFT! 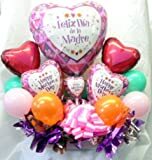 Send this enormous Valentine’s Day HEART-SHAPED Balloon Sculpture with a whopping 120 red balloons, all professionally arranged around an enormous heart-shaped wire frame…. and make a REALLY BIG impression. WARNING! This is BIG! 3 and 1/4-feet WIDE! Now THAT’S a WHOLE Lotta’ LOVIN’! Order now, and be READY TO IMPRESS… right out of the box! You HAVE to SEE THIS big, beautiful, BRAND NEW, premium, giant heart-shaped balloon sculpture in person. The entire arrangement comes in one, huge, gigantic piece, right out of the box. There are a staggering ONE HUNDRED AND TWENTY red latex balloons in this lover’s masterpiece; and it’s professionally put together around a solid wire frame that will hold its shape under the harshest of conditions. 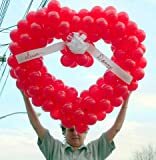 The 120 latex balloons that form this gigantic red heart will remain in perfect condition at least a week or two after delivery. Since the balloons are filled with air, and not helium, it will take a long time for them to slowly deflate.